If you’re looking for a good time in Disney Springs over Labor Day Weekend this year you’ll want to check out the Great Irish Hooley at Raglan Road Irish Pub and Restaurant. This year’s Hooley is August 31 through September 3 and will featured Irish folk music, the Raglan Road Irish Dancers, face painting for the kids, and much more. 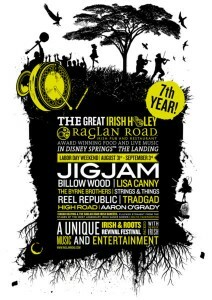 The headliners for this year’s Hooley are: JigJam, the Lisa Canny Band, and Billow Wood. Additional acts include Strings & Things, The Byrne Brothers, Reel Republic, TradGad, High Road, and Aaron O’Grady. Guests can enjoy the dancing of the Raglan Road dancers in addition to workshops about Irish dance. In addition to all the entertainment, there’s also a lot of Irish food and beer for the celebration! Check out the Raglan Road website closer to the event for a full schedule!